Wang Bin Torture in Commercial Quality, High Quality, and Museum Quality :: March 13 -April 6, 2010 :: Opening: March 20; 7:00 – 10:00 pm :: Open Source Gallery, 255 17th Street, Brooklyn, NY. 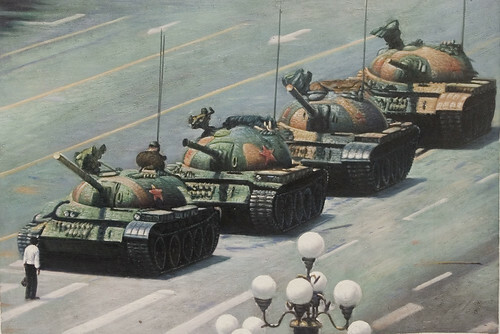 Tiananmen Square: Do you exclusively paint Thomas Kinkade paintings? Amirali Ghazemi — Parallel Paths of Contemporary Iranian Art :: May 13, 2009; 8:00 pm :: Project Room SCCA, Metelkova 6, Ljubljana. A multimedia lecture and an artistic intervention, performed by Amirali Ghazemi will present Ghazemi’s curatorial work, particularly his eleven years long collaboration with Teheran underground Parkingallery and his collaboration with International Roaming Biennial of Tehran. Upgrade! Istanbul: Accessing Information – Mithat Bereket & Atilkunst :: March 19, 2009; 6:30 – 8:30 pm :: Cibali Campus, Cinema Hall #2, Kadir Has University, Faculty of Communication, Istanbul. The meeting concentrates on mobile journalism, alternative information channels, activist criticism on media, censorship and auto-censorship in Turkish media. Speaking Out Loud Symposium and launch of Gate peepin’ — With: Florian Cramer, Jaromil, An Mertens and Peter Westenberg, Linda Hilfling, Susanne Jaschko (Moderator) :: December 18, 2008; 8:00 pm :: Netherlands Media Art Institute, Keizersgracht 264, 1016 EV Amsterdam, The Netherlands :: LIVE STREAM. Many Nettimers might already have read about www.pirates-of-the-amazon.com. The website provided a Firefox add-on that changed the experience of browsing Amazon.com by putting a slick “Download 4 Free” button on top of every product – whether a CD, DVD or book – also listed as a bittorrent on The Pirate Bay. Clicking the button on the Amazon.com product page for, say, Madonna’s latest album would yield a background search on The Pirate Bay and start up a bittorrent client to download a corresponding torrent. Reminder: Emerging Ethical Issues of Life in Virtual Worlds :: Revised call for chapters – Deadline: August 15, 2008.